A financial adviser to South African Deputy President Jacob Zuma has been found guilty of fraud and corruption. 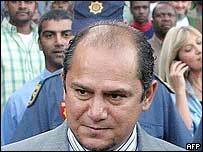 Schabir Shaik was found guilty by the Durban High Court of two counts of corruption and one of fraud. Analysts say the verdict raises the possibility of criminal charges against Mr Zuma, who is seen as a favourite to succeed President Thabo Mbeki. The judgement, read out over three days, paid close attention to Shaik's business relationship with Mr Zuma. The BBC's Barnaby Phillips in Johannesburg says many South Africans believe this is the country's most important trial since the end of apartheid. The 165-page judgement was broadcast live as it was read out over three days. An excited crowd surrounded TV monitors placed outside the court to hear the verdict, which was greeted with gasps of surprise. Our correspondent says although Mr Zuma was not on trial, the verdict could be devastating for his political ambitions. "All of [Shaik's] companies had been used at one time or another to pay Jacob Zuma in contravention of... the Corruption Act," Judge Squires said. "The evidence... clearly shows a readiness in both Shaik to turn to Zuma for help and Zuma's readiness to give it," he added. The opposition Democratic Alliance says it will now table a motion of no-confidence in Mr Zuma. But our correspondent says he has powerful friends within the ANC enjoys the support of the trade union movement and his fellow Zulu people. The cohesion of the ANC and the strength of South Africa's democratic institutions will now be severely tested, he says. Makhosini Nkosi, spokesman for the National Prosecuting Authority, declined to say whether the deputy president would be prosecuted. But he said the verdict vindicated the NPA's decision to prosecute an often controversial case. "The national director of public prosecutions will need time to consider the judgement and whether anything is to be said about it - that will be done," Mr Nkosi said in an impromptu press briefing on the courthouse steps. The Shaik trial stems from an investigation headed by the then chief prosecutor, Bulelani Ngcuka, who said in 2003 that while there was prima facie evidence against Mr Zuma, he would not press charges against him since he was not sure that there was "a winnable case". 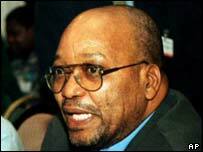 Mr Zuma has angrily condemned his "trial by media" and said he had been denied the chance to clear his name in court. The South African government has issued a statement in reaction to the verdict, acknowledging that "there may be a number of implications, for government, arising out of the judgement [but] this is a matter that will require considered reflection by relevant legal and political authorities". "With regard to the deputy president in particular, he has himself indicated that he was studying the judgement before making any detailed comment," the statement said.